And we’re in luck! 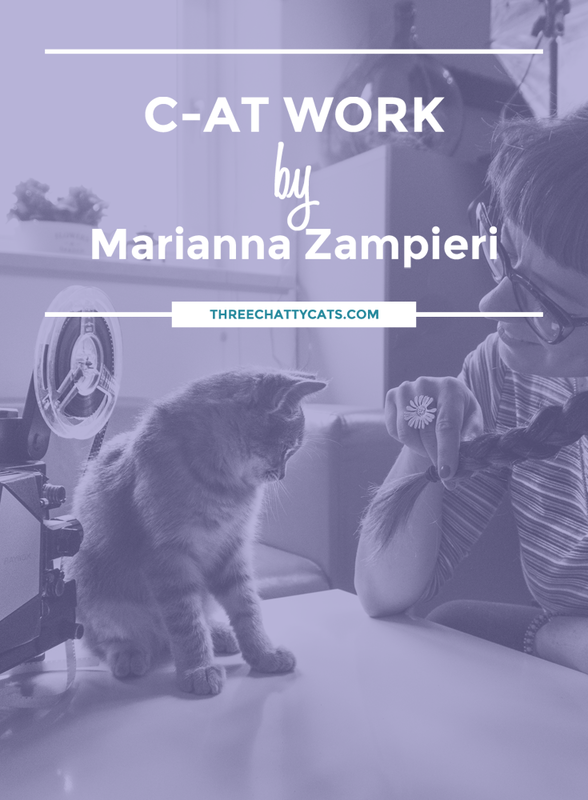 Today, Marianna has been kind enough to share one of her latest projects with us, C-AT WORK, which looks at cats in the workplace. When I asked Marianna, who resides in Vicenza, Italy, how she finds her subjects for the C-AT WORK series, she said that she has found some by simply searching on the Internet, while others are suggested to her from people she knows. I hope you enjoy this latest installment of Marianna’s inspiring photography. Also, be sure to follow Marianna’s I gatti di Vicenza Facebook page that she started with the purpose to help cats find forever homes. Yes! Not only does Marianna photograph cats, but she also organizes events to collect food for homeless cats. For all photos in this post, you can click to enlarge them for better viewing. Here, talented hairdresser Sara is assisted by Matisse, a handsome Scottish Fold, who takes the role of greeter very seriously. At this recording studio, cat lover Mario has cared for Athena since she was one month old. The gorgeous gal is now three years old and loving recording studio life. At the Atelier, you can find Matisse, a striking ginger cat. Surrounded by Greta’s beautiful creations, Matisse finds himself right at home. Even better, when little Zoe happens to stop by for a visit! The adorable Romeo is the newest addition to the studio, where Jenny also cares for two other cats, Agata and Meme. Pepe the cat is 17 years young! And Vinci, his human, loves him very much. Leo, the ginger cat, is 11 years old. Valeria has cared for Leo since he first appeared at the shop and adopted him. They have been together for 10 years. Below, we have Byron, Teresa and Obama – the cats of the library. The library staff found the siblings when they were about two weeks old and have cared for them ever since. Pictured with the trio is librarian Claudia. I hope you enjoyed visiting these workplaces today and seeing these “working cats” of Italy. You can see more photos from the C-AT WORK sessions at Marianna’s website, along with her other photography projects. And please remember to follow Marianna’s I gatti di Vicenza Facebook page to support her cat rescue efforts. Do you have a favorite photo session from Marianna’s series? Do you know any workplace cats near you? Her work is charming and exquisite! Wonderful article, Rachel, as always! :-) I love your articles and her photos! My dream is to have a cat at the office! Guess I’m going to have to start my own business, since I haven’t yet convinced a boss that we need a cat on staff…but I’m still trying. Love the photography; Marianna has a great eye. Such a wonderful bunch of working kitties and we loved seeing them at their work places! Those photos are marvelous and it’s always great to see cats getting love across the world! What a cool series! We love these photos. Lovely photos and such hard workers :) Cats always seem to just belong wherever they are in our lives. Beautiful kitties. I wish there were cats at our library and my hairdressers too. Wow, the photos are stunning. These belong in a book! There’s a very popular new book about working cats of New York…why not one with these lovely kitty images? Thanks for sharing! This photography is amazing… So beautiful and the cats look so natural in the workplace. I’m definitely “pro” cats and dogs at work! Thanks for sharing. Those are some amazing photos. I’m in awe of people with this kind of talent. so kind <3 thank you so much! What a wonderful article and the pictures are stunning! That’s talent when a picture says so much, no words are needed. You can feel the special relationship these “subjects” have. Thanks for sharing. What a clever name for this photo set! I always love when I’m in a shop and theres an animal. What a brilliant post. It’s fantastic to see so many gorgeous cats doing useful stuff :-) I wish I had that kind of talent! These are THE most stunning pictures! Such beautiful cats and such beautiful photos. Wow, I love this series! I am always so pleased to discover a small business with a resident dog or cat! Her photos are amazing! Sara and Matisse – OMGosh, I’m in love!! This is such a heartwarming series that translates the love and caring so easily – and beautifully! Great photos!! I wish I could take my cats to work with me. She really brings out each cat’s personality. That photo of the cat looking at himself in the mirror! I love hearing and seeing workplace cats! I would have loved to work at a place that had an office cat or something, but now I work from home and have 6 “office cats” :) These photos are amazing!! These pictures are great! Love that most are black & white, always have preferred that for pets. All the cats featured look like they take their work very seriously. Wow, Marianna had a God given gift for photography! I loved your other posts of her photography, and this one is extraordinary too. I love the photo of Matisse’s reflection in the mirror. Thank you for sharing her work! I love Marinna’s point of view! She is super talented! It’s hard to capture such candid photos of cats and she does it in such a brilliant way! I am a fan! these are simply amazing. Sharing with all my cat friends! My hairdresser brings her great Dane to work! I love seeing animals, especially cats, in the workplace. Not only does she take great photos but it sounds like she does other great work for cats. Beautiful photos and series! Thank you for sharing them. I don’t know of any workplace cats around me but every time I visit the local microbrewery I bring a can of catfood for the colony that lives outside. BW and Grey have been there as long as I’ve gone (about 3 yrs now), others come and go. Grey has always let me pet her (??) and even pick her up. Last week was the first time I was able to touch BW and she even let me fully pet her for awhile. Dunno if someone has socialized her or she was just tired (I woke her up) and forgot to be skittish (I couldn’t touch her when I returned later in the day). Those are just amazing pictures. We loved everyone of them and they sure do portray what a cat is really like. Well done. Matisse looking at himself in the mirror! What a handsome boy with very cute chubby cheeks! 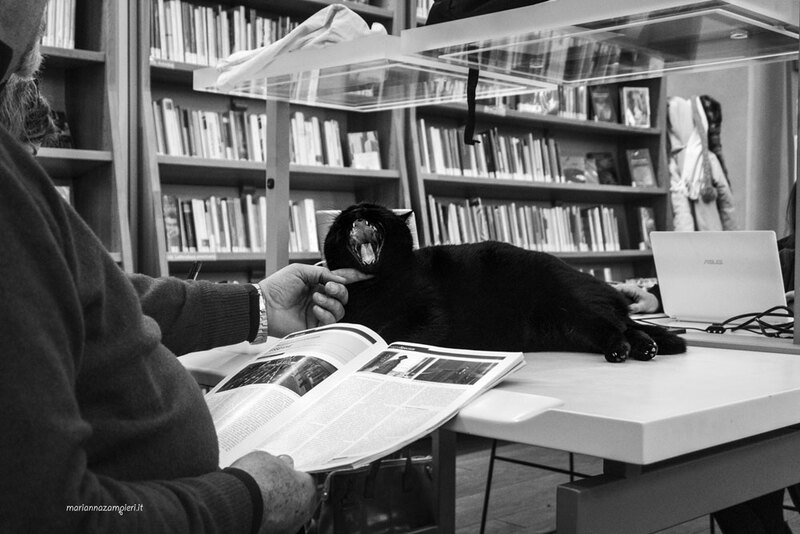 In my next life, i want to be a library cat in preferably in Italy.